Updates on AzNA Activities and what AzNA is doing to advance and promote professional nursing in Arizona. Updated Arizona Healthcare Directives Forms - both short form and large print, low reading level forms. Preparing for a certification exam seems like a daunting task. After long hours at work or other responsibilities, the idea of spending more time studying can easily cause anxiety. ANA Education & Resources has the tools you need to prepare that best fit your lifestyle. We offer everything from review manuals and on-demand webinars to practice questions that help you prepare for your certification exam. Not only are these products built for your study habits, they also fit your budget – starting as low as $50! You’ve made the decision to pursue certification, now take the time to get prepared for success. Take advantage of the study tools that fit your budget and your lifestyle with ANA Education & Resources today! Start Studying! Note from AzNA: We value our relationship with the community and are pleased to list healthcare related events occurring in Arizona. Posting of these events does not automatically carry CE credit for nurses nor have they been officially endorsed by AzNA. If you have an event you would like included on the AzNA website and/or placed in the AzNA Today Weekly Newsletter, please submit an Event Inclusion Form. ANA is pleased to support bipartisan, bicameral legislation to honor Cadet Nurses who served during World War II by distinguishing them as honorary veterans, as well as providing them with burial privileges. U.S. Reps. Cheri Bustos (D-IL), Greg Gianforte (R-MT), Cindy Axne (D-IA) and Troy Balderson (R-OH) introduced the legislation on April 3, close to the birthday of former Rep. Frances Bolton (R-OH), who founded the U.S. Cadet Nurse Corps and was born on March 29, 1885. U.S. Senators Elizabeth Warren (D-MA), Susan Collins (R-ME), Angus King (I-ME), and Steve Daines (R-MO) re-introduced the U.S. Cadet Nurse Corps Service Recognition Act in the Senate. "The Cadet Nurses answered the call of duty to fill a critical need during World War II," said ANA President Ernest J. Grant, PhD, RN, FAAN. "We are proud to support this bill to acknowledge and recognize these women for their selfless service to their country." 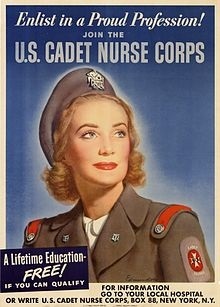 The U.S. Cadet Nurse Corps was established in 1943 during World War II to address nursing shortages. Former Cadet Nurses have been longtime advocates for being granted honorary veteran status – which this specific bill does. This legislation has garnered the support of organizations, including the American Nurses Association (ANA), the American Association of Colleges of Nursing, the Veterans of Foreign Wars, and the American Organization of Nurse Executives. You can encourage your members of Congress to pass this bill. Send your letter of support now.